It was a wonderful experience waitress was very friendly and treated us like we were her only table food was fantastic, reasonably priced and it was a relaxing atmosphere, we ate downstairs. 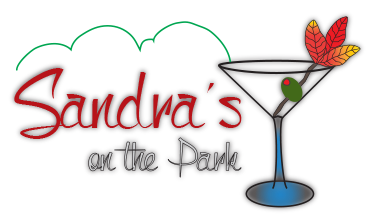 My wife and I ate at Sandra's on the Park in August for our 52nd Wedding Anniversary and found it to have great food and service. Atmosphere was very inviting, Went back there 3 months later and I had the prime ribs and my wife had the walleye. Both were fabulous. Even-though Sandra's is about a 25 minute ride on the freeway, it is well worth the travel time..
We love Sandra’s and will be back. We both had dinner specials for our anniversary night out and they were delicious! Always a wonderful dining experience! Delightful first timer. Terrific ambience inside and out, don’t let the exterior fool you. Coconut Shrimp... don’t miss em. Brussels Sprouts... Yes!!! Fish fry and parmesan fries... yes! Ribs... yes! Specialty cocktails and desserts ... yes! Prices... yes! Back again for more? Yes. This was the first visit for my wife and I to this restaurant and we were very impressed by every facet of this establishment. From the greeting received as we walked thru the door by the hostess, to the ambience of the inside dining room and the scenic patio seating area which is where we chose to have our dinner. Our waitress Dara was very friendly and knowledgeable of the menu items and the specials that the restaurant had that night. We decided not to go with an appetizer this time not knowing how plentiful the entrees would be and we were glad we made that decision because you receive plenty to eat. Every patron receives a basket of warm parmesan toasted bread which was delicious and unique. We each went with the soup rather than salad to begin our meals and the corn chowder was very good. There is a wide variety of wine selections but we chose to go non-alcoholic with a raspberry and strawberry ice tea which were both very tasty for $3.95 ($1 extra for the flavoring) re-fills available. Though ribs are their specialty we were told we both went with seafood entrees, myself with the Parmesan Crusted Cod for $20.95 and my wife with the Coconut Shrimp for $19.95. I chose to substitute the usual vegetable side of Zucchini and Squash with their special Brussel Sprouts for an additional $2.50 and I thought it was worth it. The park setting for the patio was beautiful and tranquil and set the tone for a very nice meal. Dara was very attentive despite having a handful more tables, a couple in the lower level of the patio nearer the park. All in all a very pleasant experience both atmosphere, service and food wise. We will be back as it is a nice place for special occasions. We decided to try the ribs since the last time we ate there the lady next to us was raving about them. We both ordered the large rack of ribs and were surprised that we both got 2 racks of ribs each which were almost the size of what most restaurants give you as large rack. They were so large that we both could only eat 1 rack. They were delicious and meaty and were actually pork. We have a new another nice eating place for ribs now. It came with cold slaw and my wife said it was the best cold slaw she has ever had. We had a real great waitress, here name was Kelly. The owner Sandra went over to all the customers at their tables to thank the customers for coming and if there was anything they could improve upon. The seating is limited in the building proper but it also has a great outside eating area and setting to serve any overflow or party. They also have eating at the bar if you prefer. I had my bridal shower at Sandra's and it was wonderful! We had around 35 ladies in the downstairs room for wine and apps. The raspberry brie phyllo was the crowd favorite by far. We also had stuffed mushrooms, crab rangoon, mozzarella sticks, bacon wrapped water chestnuts, and a fresh veggie tray. All the food was so delicious. Gigi provided excellent service and was incredibly sweet and attentive. The room was beautiful and required very little decorating from us. Sandra was very easy to work with and provided everything we were looking for in a venue. I had an amazing time and will definitely be coming back. Thank you so much for making my shower extra special!